Oakland (United States) (AFP) – The Golden State Warriors blazed to a record 73rd victory of the NBA season, thrashing the Memphis Grizzlies 125-104 to eclipse the 72-win campaign of the 1995-96 Chicago Bulls. NBA Most Valuable Player Stephen Curry on Wednesday scored 46 points as the reigning champions broke the mark that seemed unassailable when it was set two decades earlier by that Michael Jordan-led Bulls team. With their 73-9 record in hand and the confetti falling at a raucous Oracle Arena, the Warriors were already turning their attention to the playoffs and their larger quest for a title repeat. “Now, let’s go get this championship,” Draymond Green exhorted the delirious crowd. Green had been a vocal supporter of the race for the record, urging his team-mates toward the feat even as some questioned whether the exhausting pursuit could cost them in the post-season. NBA icon Jordan and US President Barack Obama offered their congratulations. Obama, an avowed Bulls fan, tweeted his congratulations. “Congrats to the @Warriors, a great group of guys on and off the court. If somebody had to break the Bulls’ record, I’m glad it’s them,” he posted. The chase for the record was launched by the Warriors’ 24-0 start to the season — achieved with interim coach Luke Walton at the helm as Kerr recovered from complications from back surgery. But it came down to the final game of the campaign and fittingly saw Curry reach yet another once unthinkable milestone as he surpassed 400 three-pointers for the season. Curry, who had already become the first player to make 300 three-pointers in a single season back on March 8, drained 10 from beyond the arc to take his total to the season to 402 — shattering his own previous single-season record of 286 from last season. Six of Curry’s three-pointers came in the first quarter, when he exploded for 20 points and almost out-scored Memphis single-handedly as Golden State took a 37-23 lead. The Grizzlies never got the deficit below 11 points from there and Curry, who put up a career-high 19 three-point attempts, had the luxury of resting the entire fourth quarter. Curry’s 41st point of the night, late in the third period, ensured he would finish the season with a scoring average above 30.0 points per game, making him the only Warrior in history other than Hall of Famers Wilt Chamberlain and Rick Barry to hit that mark. Curry also handed out six assists and four rebounds as the Warriors improved to 39-2 at home. 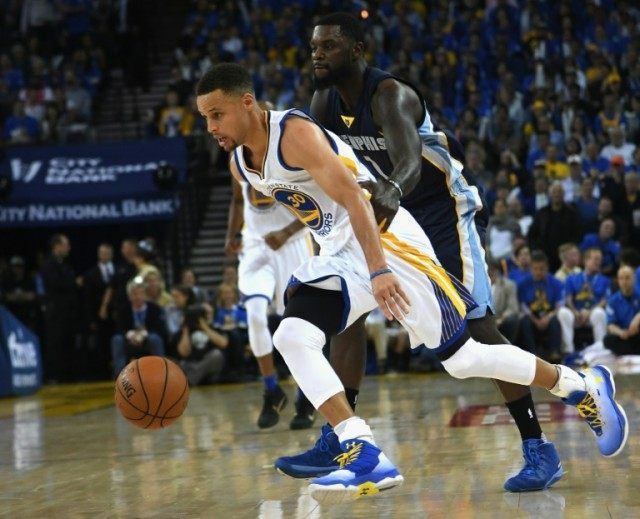 The Warriors had barely edged the Grizzlies 100-99 in Memphis four days earlier to keep the quest for 73 wins alive. Their last-four must-win games included two victories against powerhouse Western Conference rivals San Antonio. They roll into the Western Conference playoffs as the top seed and in the first round will face the eighth-seeded Houston Rockets in a rematch of last season’s conference finals.